I am often approached by people who are looking to invest in a personal training course. Now I have written posts and articles on this many times before but this one is new for 2018. We are… well I hope the verge of some great developments and this will effect some of the decisions that you might make when considering becoming a personal trainer. First of all I have been involved in fitness education for over ten years and in that time I have helped over 1,500 people become a personal trainer, I have worked for a wide range of personal training course providers, designed courses and worked in quality. Now why am I telling you all of this? Well I think it is important that you know who’s advice you are taking and what their background is. This background allows me to have a detailed insight into the training of personal trainers. 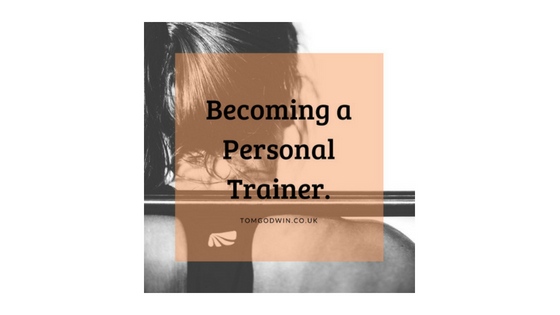 In my experience there are a number of things to consider when looking at training, and finding the right personal training course for you. The first thing I would like to cover is that there are so many training companies out there (some of which are awful) but most are decent, it takes a little searching for which offers the package that is best for you. This is not always the largest company, or the one with the most flashy website, but the one that offers the package that fits with your specific needs. All reputable training providers should be able to give you an awarding body certificate, the two biggest in fitness and personal training qualifications are Active IQ and YMCA Awards (but many others such as Innovate, NCFE, City and Guilds, to name a few offer these qualifications). Any course you do, no matter how good (subject for another post) that does not offer you an accredited awarding body certificate may mean that you struggle to have that recognised for things like insurance and employment. If unsure you can always check out the awarding body websites as they list their approved training providers. If you do a course that is recognised you can then look to see if it allow entry onto either or both of our sector bodies. These are REPs (Register of Exercise Professional) and/or CIMSPA (Chartered Institute for the Management of Sport and Physical Activity). These bodies both offer systems that act to ensure that the course meets the minimum industry standards set out by Skills Active. They then offer memberships to recognise you as an industry professional. Recognition from these two bodies is often easy to spot, just look out for their logo on the training providers website. A personal training course is not a small investment (and if it seems too cheap compared to others you have researched… There is normally a catch), and as with any investment you should do a little digging. Have a search on Google for any reviews relating to the training provider, have a look at their website, and look at companies house to make sure they are all set up as a legitimate business. There are many training providers that set up every month, so although some of these new companies might have some amazing offers you need to think the course can take up to a year and you don’t want to pay and do all the work just to find out the provider has gone out of business before you get certified. I have found a good way to get a judge of a company is to have a look at its social media, do they showcase loads of happy smiling graduates? Do they respond to messages quickly and professionally? And if you spot a complaint is this dealt with in a manner that you would expect from a professional training provider. The things that really make a difference. In essence all training providers are supposed to cover the same content as this is set out on a national basis across all Awarding Bodies and therefore training providers. BUT this does not mean all training providers are equal… Far from it! What it comes down to is two main factors 1) How will you be taught? 2) Who will be teaching you? If you are not disciplined self-study is a hard option, things get in the way and without a tutor to focus you in many cases you may not complete the course. If you are struggling to understand a concept how will you get it if studying essentially alone? What support do you have? In some cases there are remote tutors to help others it is down to you. You just need to think about what support you may need. There is limited time to interact, reflect and apply the content, so there is an argument that this leads to more surface understanding at best. Where as if you are in a classroom interacting with a tutor and other learners you are more likely to retain the information given. On the flip side these courses can be great for those who already have the background knowledge and application, so for example sports science graduates. In my experience there is a marked difference between those that have done a longer course than those who have done a short one. Not in all cases but it is worth thinking about, longer courses are a bit more expensive but students generally come off these courses with a much better grasp than when they have only spent a day or two learning the content. A key aspect of your enjoyment of the course is the person who will be teaching you, they can make or break a course. If possible you should try and meet the tutor before enrolment, this can normally be arranged by contacting the training provider or by attending open events at the training venue. This will also give you a chance to ask any questions you may have fact to face with a representative of the training company. I would also look for a tutor that has had experience of the industry and can give you all those little tips on how to get started. Additionally somebody with more industry experience will be able to bring some of the theory to life a little more by talking about how it is applied in a real life setting. If you have any questions do give me a shout or comment in the comments section below.